Well I haven't updated in a while so here we go. NaNo: Last Sunday and Monday (the 8th and 9th) I didn't write at all so the whole week has been a slog of trying not to fall any further behind. I had a good day today and finally, finally hit a spot where the words didn't require concentrating until I sweated blood to get the out. I'm still behind but I wrote 3k today and if I can manage that again tomorrow I will be caught up. 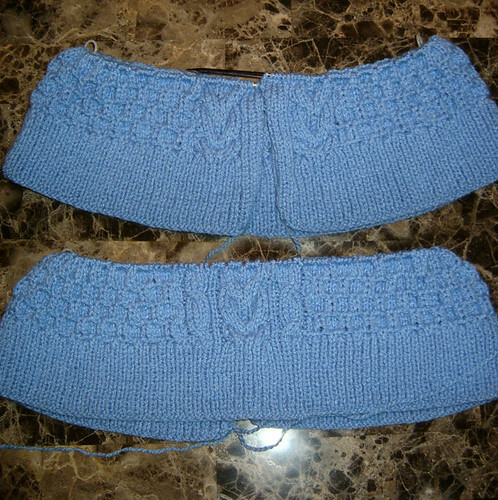 Knitting: I've got eight inches done on the vest for my Mom for Christmas. That's about 40% complete since Mom is shorter than I am. Still no plot really, but there are a few more characters, which will help. Of course two of them were mostly filler, though I don't think Muriel is inclined to stay that way. Other than that there was also some world building today, or rather, world enhancing since I think I'm writing what amounts to "this world plus supernatural beings". But I'm feeling around the edges of one, maybe. At least I'm getting words down which makes this much better than this time last year. This is mostly so when I'm freaking out next year I will have proof that in 2009, as in 2007, I didn't have anything until a character showed up on the 29th. I don't know what Apollonia does but she's making herself comfortable. Now I need at least a genre and maybe a second character, based on past NaNo novels I can get something if I have that much. Yes, I intend to write another partial novel this year. I have no idea what I am going to write but the odds are it will be something in the science fiction and fantasy continuum as usual. Also as usual, I've been getting pings off my older NaNo attempts. Last year's story was really hard to write, I spent the first half of the month whining (sorry Kris!) and writing was about as easy and pleasant as pulling teeth. Once I moved the story from England to New England it started rolling for me and ended up picking up things I hadn't expected, like alchemy and alchemists that aren't what they seems and occult books that manipulate events and people around them... and Lovecraft's cousin. Needless to say that story is a bit of a mess. The last few days have found my brain turning that tangled knot in all directions and tugging on things that look like they might lead to loose ends. I think I might know how to untangle it now. And that is how I know that NaNo is coming, because my brain never gets enchanted with the older stories until it knows it has to start coming up with a new one.